For those of you who read this post, you will remember that I have a particular fondness for vintage knitting and crochet patterns. Charity shops are my usual source, but a few weeks ago, my Mum decided to sort out her under stairs cupboard and unearthed some real gems in the process. Mum had told me about her collection of Mon Tricot patterns and had thought them lost. Having looked through them, I am very glad that they weren't. Apparently, these pattern 'books' (they are more like magazines) were considered quite expensive in their time but I can understand why. I wish there was a modern-day equivalent; I am a bit tired of the current magazines on offer which seem to regurgitate the same old patterns and have endless ad pages. The contents of this book alone could keep me busy for months. Now that I have learned to crochet, I am seeing all sorts of possibilities in these patterns. Those little slippers are just so cute. Not sure I'd be up to creating this monster, apparently it's meant to be a dolphin! These would be great with leggings underneath, or maybe frilly pants? And who could be without a pencil case in their scarf? There are lots of great home furnishing ideas, you just have to imagine different colours. These flowers could be adapted for all sorts of uses. I think they're very Attic24. I am seeing crochet seat covers in a vintage VW camper, it's a shame modern headrest would complicate the pattern. I think this wave pattern might just be my next blanket. And we all know I like a good zigzag. This is also a zigzag design, but I could really see myself in this. But would I have the patience to finish it? More dresses that could be made pretty funky! I particularly like the middle (light brown) dress, but to make it I'd need 26 balls of 4ply yarn. Hmmm. Can't you just picture the cheese and pineapple and the black forest gateaux?! Not sure about the socks, but the bag would be really simple to do. These tank tops would be fab in modern colours and you only need three balls of yarn to make them. Well, maybe not this one, and definitely not the hat! I actually really love the bikini on the left, but if I made it I would not be going anywhere near water. It's about time these came back isn't it? Well, I leave you with these for now. I am meant to be stitching away but my machine has decided to go on strike so it's back to the brooches I think. In camping news, we decided against roughing it in the tent last week in view of the weather forecast and had a little holiday to Wales in a caravan instead. Luckily we didn't get washed away and the journeys and the rain mean that my baby ripple blanket is almost done. I will show you pics next time. I would just like to say a quick 'hello' to my new followers and to my overseas readers who I know are lurking around. Don't be shy, say hello and let me know what you think of these fab patterns, or anything else you'd like to share! Unfortunately, what with all the Larmer Tree stuff I can't really make ANY of it yet! 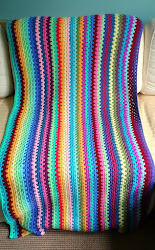 I am just about finished on the edging of my ripple blanket, so I may make a start on a wave blanket as I can sell that. What I am actually tempted to try first when I get time is the bikini, it will be perfect for all the leftover bits of handknit cotton I've got! Wow, such nostalgia! I particularly love the zigzag maxi dress! I love the little footstool, its gorgeous. The colours and designs are so similar to whats in fashion today, it always comes around again. I love these patterns Beth! Especially the zig-zag maxi dress :) There will be endless possibilities for projects and those flowers are sooo Lucy/Attic24! I must hunt round the charity shops and see if I can find some retro patterns too! Ripple Baby Blanket - Finished!